"Outer space now belongs to 007." Roger Moore stars as British secret agent James Bond in Moonraker, in which he is assigned to locate a stolen space shuttle of the same name. It is a tale of intrigue, espionage, and action with a dash of high-tech science fiction. 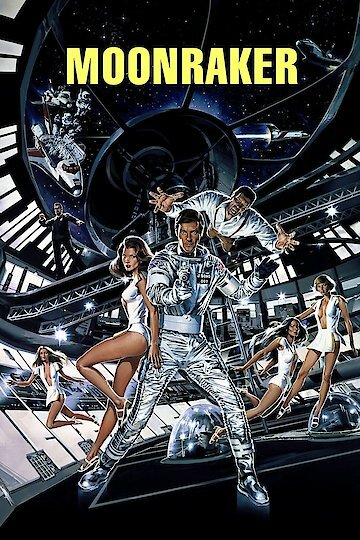 James Bond, Agent 007, is sent to investigate the whereabouts of the Moonraker shuttle (on loan to the U.K. from aerospace company Drax Industries) after it is hijacked during flight. While on his way to England by plane, he is attacked by the hired thug Jaws and narrowly escapes with his life. Upon investigation, not all is as it seems at Drax Industries. With the help of the beautiful Dr. Holly Goodhead and Corinne Dufour, Bond travels all over the world and beyond to unravel a plot that could doom the human race as we know it. Moonraker is currently available to watch and stream, download, buy on demand at Amazon Prime, Netflix, Amazon, Vudu, Google Play, FandangoNow, iTunes, YouTube VOD online.